NOTE: The Walker was never released and so the specifications may be subject to speculation. Case Type: Custom stylised black case. Chipset: AGA with extended I/O (VLSI) + Toni Chip. 40Mhz base frequency with a bridge to the AGA chips. Kickstarts: V3.2 (never publically released). 1MB Kickstart compated to 512K Kickstart for most Amigas. NOTE: It is not clear whether these are the actual slots, or whether a riser card containing slots was designed to be plugged into them. This seems more likely. RAM sockets: 2 x 72pin SIMM slots. NOTE: This list is likely to be incomplete. Floppy Drive: 1 x Internal "1.44MB/1.76MB" Drive. When Escom took over the Amiga operation after Commodore's demise, in addition to re-releasing the A1200 and the A4000T, they also designed a totally a new Amiga. 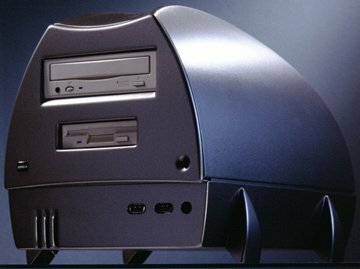 This Amiga was known as the "Walker" throughout it's development stage, although it is not known if this name would be kept had the machine been released. Unfortunately this machine was never released due to Escom going bankrupt and subsequently their Amiga Technologies subsiduary. At least two prototypes exist and were housed at the Amiga International Inc. HQ, Langen, Germany although it is unknown if they still reside there. Petro (a now ex-Amiga Internation Inc employee) is seen demonstrating them in a 1999 Amiga OS 3.5 promotional video. 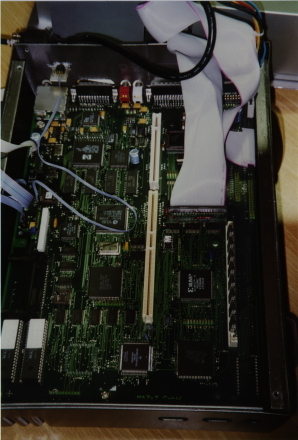 Toni was the "system controller" and implemented for example, the DRAM interface. The FPGA used on the prototypes had a few frequency problems and were not completely stable at 33MHz. The motherboard contained a SuperIO chip and a Dallas Clock, aside from the "Toni" custom chip (really an FPGA). The original prototypes did not contain the Dallas clock due to some kind of hardware problem not found before CeBIT (a show where the Walker was demoed). Unfortunately much of the software side for driving the hardware remains undeveloped as Escom went into liquidation before it could be completed. Several Walker units were built but only two were ever placed in the stylised black case. The 3rd Walker shown at the CeBIT show was in a standard PC tower as the motherboard was Baby AT form factor. The Motorola Coldfire processors had been considered as an option for the Walker however this idea was dropped rather quickly. Although the Coldfire's share a lot on common with the coventional 68k series of processors, they are not entirely compatible. The earlier designs used an 030@33Mhz whilst the "production" version would have used an EC030@40Mhz. This would have meant that the final version would be lacking an MMU but as this is rarely used on the Amiga, the cost reduction and speed increase was considered more beneficial. The Walker used Kickstart 3.2 in a 1MB ROM (most Amiga's use 1 x 512K ROMS, 2 x 256K ROMs with some exceptions) and contained various upgrades to the OS such as partitions larger than 2GB, hard drives larger than 4GB and a revamped CD Filing System as well as Workbench 3.2 (V43.1). As a side note, many of these fixes and a lot more were resolved at the release of AmigaOS3.5 (which still uses Kickstart 3.1).